I had a very bad craving for green mangoes yesterday. I was imagining eating green mangoes dipped in alamang (shrimp paste) since morning. Not that I’m pregnant, it was just plain craving! I guess green mango dipped in shrimp paste is every Filipino’s favorite. Just the thought of it makes us drool! Luckily, I found some apple mangoes at Walmart. It’s a good substitute to the Philippine’s Indian and carabao mangoes. They are priced at 58cents each. But almost all of them are ripe so I just bought 3 pieces…and last night, I made Ensaladang Mangga (mango salad). I added chopped cilantro, green onions, garlic and ginger to the usual tomatoes and onions...and it was so good! We paired it with grilled liempo (pork belly) and bratwurst. 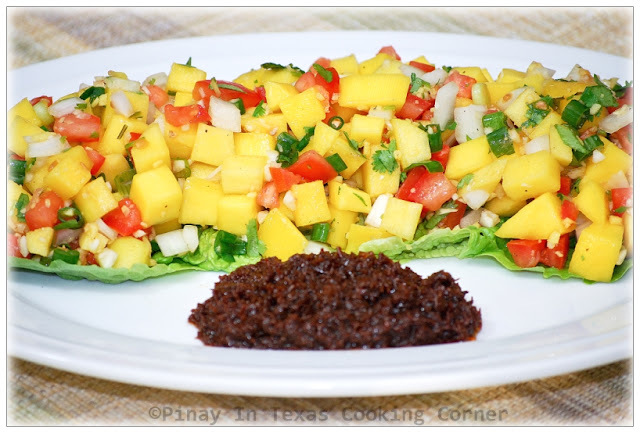 Mango salad paired with any grilled/fried meat or fish is just divine! We had a very appetizing dinner. 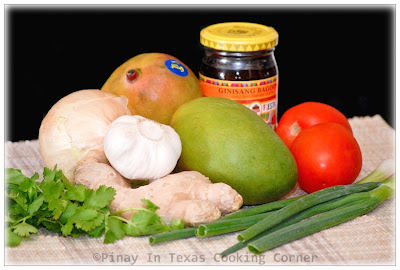 Even Clarise and Cherlin ate some Ensaladang Mangga, but not with shrimp paste. They pour some soy sauce on it. This salad is very easy to prepare. If you don't like the thought of it having shrimp paste, try it with soy sauce. 1. In a bowl, mix all ingredients except for alamang. 2. Transfer to a serving platter and put alamang on the side so those who don't like it can enjoy the ensalada too. If everyone is eating alamang, you can mix it together with all the ingredients. 3. Serve at once to enjoy the crispiness of the mango. Serve as side dish for grilled/fried fish or meat. 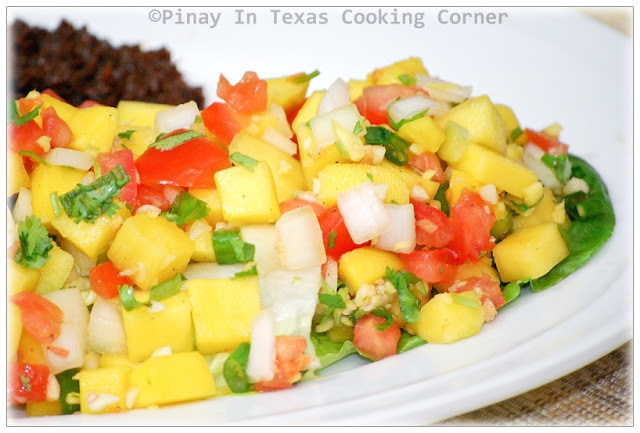 I made something similar but called it mango salsa, to go with tandoori chicken. hmmmm...I'm sure it's appetizing too!